How would you like to look and feel years younger, revitalise your body, your outlook and your life? 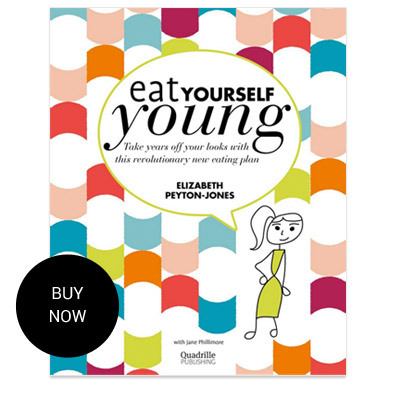 Elizabeth’s fabulous book, Eat Yourself Young (EYY), is a revolutionary new eating plan that can help you achieve your aims. You can preview the first chapter of Eat Yourself Young below, to enlarge simply click the page. We have signed copies of Eat Yourself Young available, to purchase please click here. The EYY Eating Plan is easy to follow – you don’t have to count calories or starve yourself. The dishes are full of flavour, and will help retrain your palate and attitude to food so you effortlessly understand what’s most youthing for your body. And the longer you eat the EYY way, the more the good effects accumulate, and the more you’ll enjoy the looks, energy levels, lifestyle and attitude of someone much younger than your years, whatever they may be.